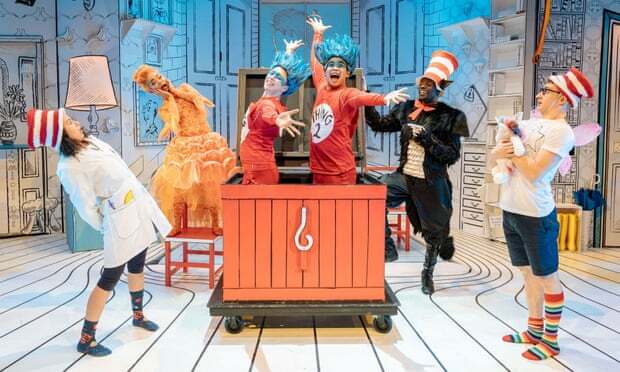 Before Dr Seuss’s infamous Cat has made his entrance, the audience has been soaked with water pistols and raucously encouraged to sing, dance and holler. This new version of the classic picture book doesn’t hold back. It’s a bit too in-yer-face for this critic but it will leave you brimming with energy, and perhaps a little dazed. Suba Das’s pumped-up production of Katie Mitchell’s adaptation has been created in association with the National Centre for Circus Arts, and the focus is on spectacle rather than storytelling. Nana Amoo-Gottfried’s Cat wears a black furry coat with a big bushy tail, and spends a great deal of time balancing on top of a giant circus ball. Concentration is etched on to his face as he wobbles away and tries to hold on to a book, boat, fish and a fully iced cake. There’s an air of anxiety, which is understandable but a little off-putting. Where’s the eerily confident Cat in the Hat we’ve come to know and love – and even fear a little, too? 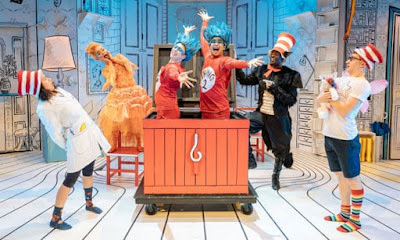 Charley Magalit, as the fish, wears a bright orange dress and wig, and rolls on to the stage in a human-sized hamster ball. It’s a spectacular entrance but it’s quite tricky to hear what she is saying, or singing, inside her giant plastic ball. There are similar distractions when it comes to Melissa Lowe and Sam Angell, who play young Sally and her brother. Both actors work hard to keep the children engaged and scamper excitedly about Isla Shaw’s sketchbook set and right through the audience. Unfortunately, they’re forced to compete with David Gregory’s booming sound design, which underlines every physical gag with an impossibly loud crash, bang or wallop. Tasha Taylor Johnson’s original songs are high-spirited and fun but – and this feels like a crucial oversight – they break up the hypnotic rhythm of Dr Seuss’s virtuoso verse. It’s down to the Cat’s manic sidekicks, Thing 1 and Thing 2, to recapture the freewheeling energy of the book. Celia Francis and Robert Penny fly through the air and clamber up the living room walls, fizz let free from a can. They’re an absolute delight: the cat’s whiskers.